St. Patrick's Day Special, 22% Off! This crystal Irish body jewelry from The Irish Gift House features Happy St. Patrick's Day and two leprechaun hats. This St. Patrick's Day body jewelry is non toxic, easy to apply and easy to remove. Not for children under the age of 3. 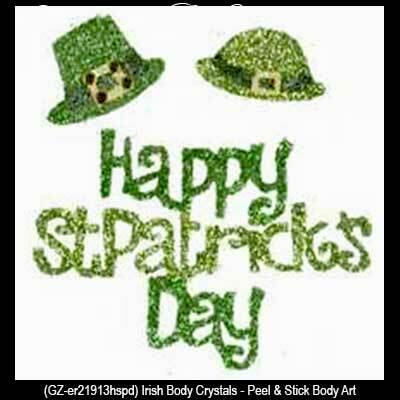 You will have the wish of a Happy St. Patrick's Day with this 2" wide, peel and stick, Irish body art. This 3 piece set features the words Happy St. Patrick's Day along with two Irish hats with buckles, all sparkling with green crystals. The Irish body jewelry is superior to a temporary tattoo because it has shimmering crystals.